Wide pave set diamond band. 5 rows of graduating diamonds in round brilliant cut. 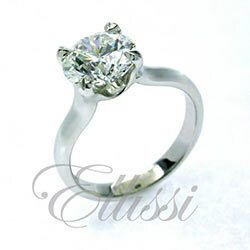 Diamond sizes range from 0.15 to 0.25 ct with a total diamond weight of 5.50 ct F/SI1. The ring band was 18 .5 mm wide across the top and set across the top third (approximately). This type of ring can be made with many or only a few rows of diamonds and diamond sizes can be adjusted to accommodate differing widths.